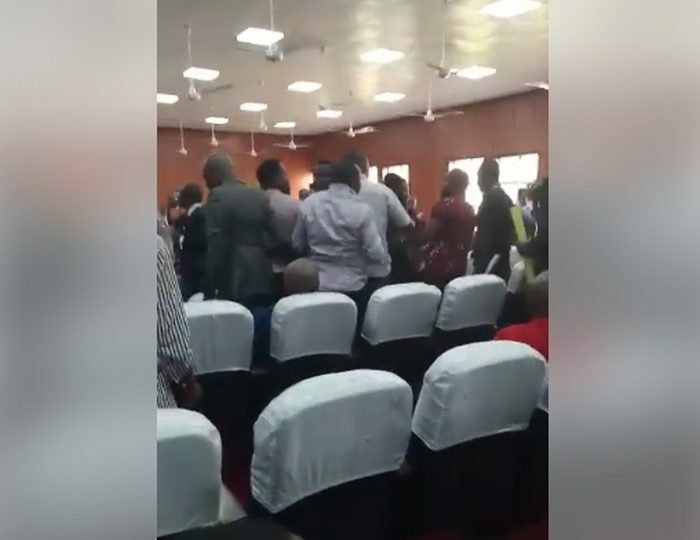 A sitting at the Court of Appeal in Port-Harcourt, Rivers state, was disrupted yesterday during an appeal filed by contending parties for the 2019 tickets of the All Progressives Congress (APC). Read below the press statement as issued by Rivers branch of APC. The Rivers State Chapter of All Progressives Congress (APC) is shocked how two lawyers who are appointees of Gov. Nyesom Wike led PDP thugs to assault innocent witnesses in the Appeal Court of Justice Ali Gumel in Port-Harcourt yesterday. Trouble started after the lawyers of Rivers State chapter of Peoples Democratic Party (PDP) presented their matter before the Justice Gumel appeal panel. Later, the court called the matter between the Rivers State Chapter of APC and Senator Magnus Abe. As counsels to parties announced their presence and presentations commenced, Barr. Chris Itamunala and Barr. Osima Ginah led a group of PDP thugs into the courtroom and they started attacking lawyers and witnesses claiming that the court should not sit in compliance with the ongoing NBA court boycott. Our party members, who were eager to have our matter heard by the Appeal Panel, were not spared by the hoodlums. Apart from the Justices, the PDP thugs led by Itamunala and Ginah assaulted everyone in the courtroom. All appeals by Justice Ali Gumel and his colleagues fell on deaf ears as the thugs kept shouting that the sitting must not hold even as they continued the physical attack. We recall that the previous day, the same thugs had invaded the court claiming to enforce the NBA court boycott. That fracas elicited strong words of condemnation from Justice Gumel. As a political party, we condemn this assault on the judiciary as seen today. We believe that members of the press who witnessed the unfortunate incident will not be deterred in bringing it to the public space for the benefit of Nigerians. Equally we believe that well-meaning Nigerians will condemn this act of wanton assault and desecration of the judiciary by agents of Rivers State Government under the guise of enforcing NBA court boycott. We know that the main purpose of the assault was to cause an indefinite postponement of the hearing of APC matters by the Appeal Court with a view to scuttling APC presence on INEC ballot for the forthcoming elections. We urge members of the judiciary not to fall for the cheap antics of Gov. Nyesom Wike, his agents and the PDP. We enjoin APC members to continue to remain law-abiding as we will surmount the present temporary hurdles by our opponents.